Profiles on the authors of this website and information about their products. Chris Marais has just launched The Journey Man, his book of reporter’s stories. His wife, fellow writer Julienne, says he was once a very, very naughty boy – but he’s all better now. 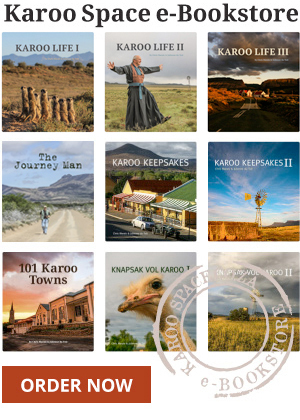 Karoo Space wins Best Travel Book and Best Website at Richmond Festival. South Africa’s first e-Bookstore – right here on Karoo Space! Chris Marais has worked on assignment as a photo-journalist in more than 50 foreign spots, including Mongolia, Borneo, Timbuktu, Madagascar and the French Quarter of New Orleans. He has come home to the Karoo. Julienne du Toit is no stranger to a desert. She began her love affair with the world’s dry spaces, aptly enough, by crossing the challenging Nullarbor Desert in Australia in 1998. Reaction from our readers on the new eBookstore.